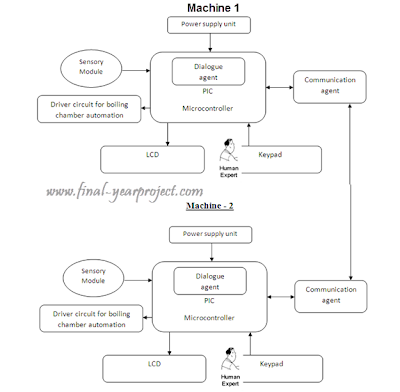 This is a good Electronics final year project report on "knowledge evaluation based intelligent tool based on M2M ". In this Project, the agential concept of the dialogue module, which is necessary for inter-machine cooperation, was presented among the three modules. The system consists of two MCUs, each of it has inbuilt dialogue agents; the MCUs work is to control the boiling chambers. The MCU it has a sensory (temperature sensor) to get an at present boiling chamber status. You can also Subscribe to FINAL YEAR PROJECT'S by Email for more such projects and seminar. The knowledge-evolutionary intelligent machine-tools have three mechanisms. First, it has the sensory function similar to that of humans. Secondly, it has communicational function. Namely, it acquires the knowledge based on indirect experiences from other experts, using the human-dominated linguistic ability. Lastly, it has reasoning function. 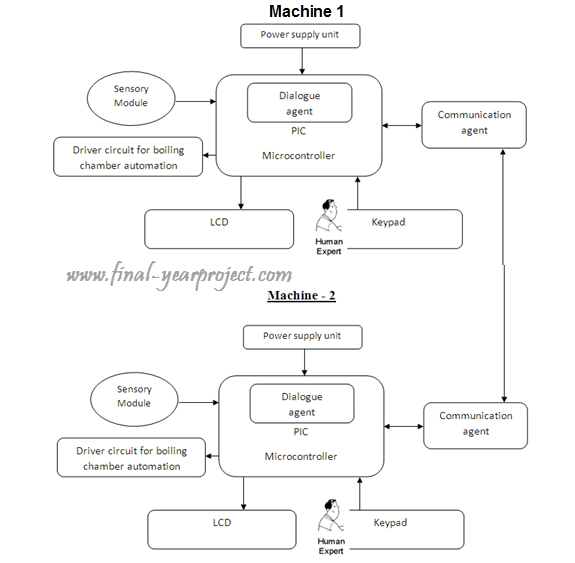 This report contains full block diagram, circuit diagram, microcontroller programming for this project, results conclusion etc. Use it for your reference and study work.